POPULAR! 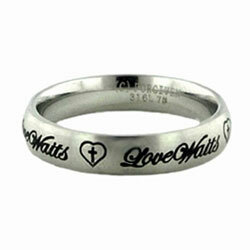 Love Waits Ring with a heart symbol with cross inside! 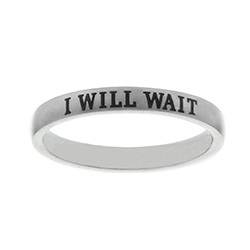 This ring is popular for girls that have made a purity commitment. This ring is also popular to have engraved with a name or date on the inside of the ring. 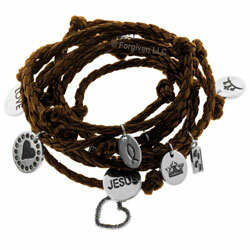 Extra Long (72") braided brown leather bracelet with 10 assorted charms! Bracelet wraps around the wrist many times for a comfortable fit. This new ring is made of high-quality stainless steel. 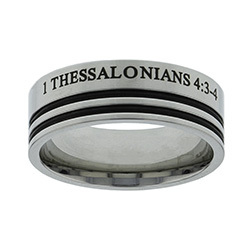 The outside of this band reads "1 Thessalonians 4:3-4" and the inside reads: "I will remain faithful and pure". This Forgiven Jewelry product is popular for guys in their teens. The band is 5mm wide and it is engravable. This ring has the star of David on the front and a Cross on the back. It also has the Aaronic Blessing in Hebrew (Numbers 6:24-26): "The Lord Bless You and Keep You. The Lord make his face shine upon you and be gracious unto thee. The Lord lift up his countenance upon thee, and give thee peace." It is made of stainless steel and is a product of Forgiven Jewelry. The band is 8mm wide, standard fit, and engravable. This unique ring has two bands that are symbolically interlinked. 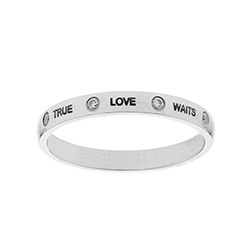 The silver band reads, "TRUE LOVE", and the black band reads, "WILL WAIT". The two rings roll up the finger for a nice fit and feel. The ring's width is 8mm and it is made of stainless steel. This standard-fit Forgiven Jewelry design is very popular. 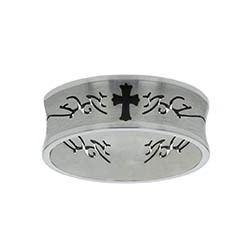 This plain cross spinner ring is made of high-quality stainless steel and is very durable. The band is 5mm wide and the fit is standard. This ring is made by Forgiven Jewelry. The crystal true love waits ring has 4 crystals placed on the front of the ring. The crystals separate the words "True Love Waits". 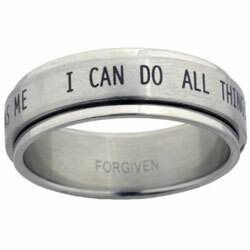 This Forgiven Jewelry ring is popular for girls. The standard-fit band is 3mm wide. 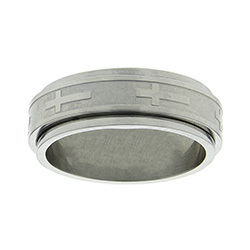 This Forgiven Jewelry ring is made of stainless steel. The cross is laser etched and the tribal design is eroded/cut out of the ring. The standard-fit band is 5mm wide. 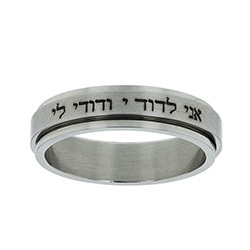 This stainless steel spinner ring comes from the Song of Solomon 6:3 "I am my beloved's, and my beloved is mine." 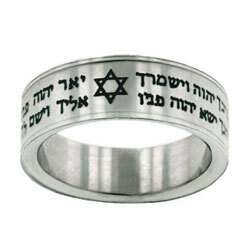 One side of the ring is in the sacred Hebrew text, the other side is the English translation. 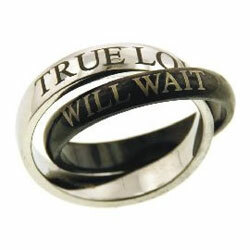 This ring is popular for couples that have pledged their purity. This stainless steel spinner ring has the phrase "I Can Do All Things Through Christ Who Strengthens Me"
The simple, yet significant phrase is laser etched on the outside of this petite stainless steel band ring. High Polish Flowers are engraved against the brushed metal background creating a truly beautiful ring -measures just over 1/4" (5mm) wide. It is a larger band ring 1/16" (2mm) thick. 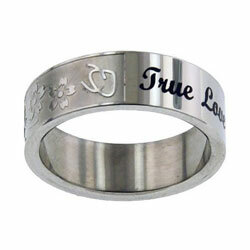 Cursive text "True Love Waits" is etched on high polish stainless steel. It's your choice what side to show while wearing this ring.